As Dominicans get ready to observe World Rivers Day (WRD), even in our usually insignificantly small way, the region is experiencing one of the busiest hurricane seasons. Irma, the most powerful storm of the Atlantic hurricane season for decades, devastated many of our northerly sister islands. And as we go to press on Friday another potentially destructive storm, Hurricane Jose, is barrelling across the Atlantic Ocean, along the same path that Irma took on her road to death and destruction. As we prepare to lend a helping hand to our friends and relatives in the northern islands, mainly with clear, clean water, we cannot help but compare their situation with Dominica's in 1979 when Hurricane David, a category 5 storm, slammed Dominica stripping off almost every leaf from every tree in its path. As you recall, the country's housing stock was destroyed and thousands lived for many weeks in tents and shelters. For weeks electricity and water were scarce commodities then but thankfully our rivers provided some solace, for bathing, washing and for performing other personal functions. Unfortunately the people living in these islands in the northern Caribbean that Irma devastated last week will not have the luxury and privilege of using rivers that Dominicans had in 1979, or today for that matter. Nonetheless, Dominicans continue to take their rivers for granted and, as a tangible example of that fact, they ignore important events like WRD that help raise awareness of the importance of rivers and the need to keep them alive for future generations. As we said in an editorial on the subject last year, Dominica should be leading the way in celebrating, utilizing and preserving rivers and waterways. WRD then should be one of the most important days on the island's calendar. But it is not. As we have said on numerous occasions, it is inexplicable that Dominica has taken such a lackadaisical approach to the protecting and preserving of our rivers and embracing the opportunities that the international community offers to raise awareness of the status of our rivers. The fact is all our rivers are dying or already dead-all 365 (real or imagined) of them- and it appears that our government and its citizens couldn't care less. For instance, WRD 2017 is to be held in two weeks but apart from the exemplary efforts of Father Franklyn Cuffy, there appears to be no plans, no pronouncements, urging people to observe that important occasion. Nevertheless, rivers, lakes and waterfalls mean so much to our existence; these are the "gifts so rich and rare", that our national anthem mentions. That our rivers are dying right before our very eyes is undisputable; but what is perplexing is that we say and do so very little as we, almost sadistically, watch them slowly die away. Our government, the ministries of education, tourism and forestry in particular and the private sector institutions such as DOWASCO and DOMLEC should be ashamed of themselves; they should be leading the way towards raising awareness of the state of Dominica's rivers because without rivers their businesses will be much less lucrative and attractive. In addition, as we suggested last year, Prime Minister Roosevelt Skerrit, the country's minister of finance must look beyond the building of resorts. He should be utilizing some of the finance derived from the Citizenship by Investment Programme to fund research and development programmes aimed at saving our rivers. Without rivers Dominica will become a wasteland and resorts will become giant white elephants. Unless the people we expect to live in these resorts have something to see and admire, like "our gift so rich and rare" (our rivers and lakes and waterfalls) they will not come to Dominica. As a friend who is employed in tourism in the region said recently, people do not travel to countries like Dominica just to live in resorts (there are many luxurious hotels closer to their homes, in Miami, Atlanta or London); they come to Dominica to admire and enjoy nature, partake in our music and dance and enjoy our cuisine. Destroy our rivers and you can effectively say goodbye to tourism. World Rivers Day is an annual celebration of the world's waterways with people around the globe taking part in local events such as paddle tours, nature walks, tree plantings, river clean-ups and community festivals. 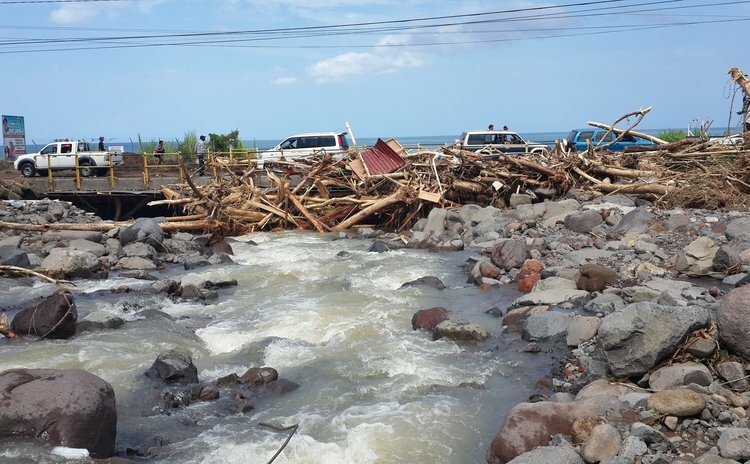 As we reiterate year after year in our editorials in the SUN, Dominica's rivers face a number of challenges such as pollution, deforestation and urbanization. The mega storms affecting the region and the increasingly frequent tropical waves help pollute our rivers with storm water laden with sewerage and toxic waste. But the greatest threat to our rivers is neglect. We behave as if our rivers have been here for centuries and they will be here for centuries to come. Believe it or not, in Dominica there is no organisation or ministry of government that is mandated to care, clean, manage and protect our rivers. They all flow gentle and quietly to the sea and no one cares that that flow may stop. Someone commented last week that he would be surprised if there is a trickle of water left in the Roseau River by 2050 given the pace at which the water level in that river is decreasing. We totally agree with that prediction. Another direct and far-reaching threat to our rivers is the phenomenon of climate change. We had a front seat view of the impact of climate change on 27 August 2015 when Tropical Storm Erika dumped 10 inches of rain on the island within six hours and even quiet streams became raging monsters that swept away people, places and things. And ever so often, what appear to be relatively mild tropical storms cripple DOWASCO's water system for days and even weeks in many areas including the city and its environs. There is no longer any doubt that the world's climate is changing and that we live in a period of increasing and severe droughts, super storms like Irma and Harvey and Jose, rising ocean levels and water shortages. As the phenomenon of climate change progresses, it will continue to have a negative impact on our water resources. In fact many of our rivers and streams are already changing. If these trends continue and worsen, there will be serious effects on communities, industry, infrastructure, and recreational opportunities. To address this in any substantive way will require long-term plans to deal with the changes that are foreseeable. At local levels, we should develop strategies to help us better manage our water resources in times of drought, or too much rain, for the good of residents and our tourists.